Your smile is a valuable and essential part of your life, whether you’re 7 or 77 – it helps you eat your favorite foods, speak clearly to friends, and showcase your own happiness whenever you like! That’s why keeping your teeth and gums healthy over the years is so important, and at Roselle Park Dental & Implants, we’d like nothing more than to support you and your family throughout this lifelong goal with our comprehensive menu of services, state-of-the-art modern setting, and exceptional doctors and staff members. Contact our Roselle Park, NJ office today to get started! We aren’t interested in pressuring our patients into overblown treatment plans or padding our bottom line above all else. Our team works hard each and every day to better every patient’s quality of life, and we always take the time to explain all of our available services in as much detail as you want so that you fully understand your choices. Our goal is to help you discover the ideal treatment plan that creates exceptional results while still fitting your personal needs, budget, and schedule. Our team understands – very few people actually look forward to their next dental visit. 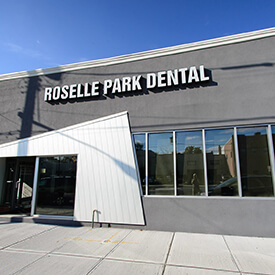 At Roselle Park Dental & Implants, we take care to make our office space as warm and inviting as possible for patients of all ages. Calming sedation dentistry services are always available if you find yourself struggling with feelings of anxiety or fear before an upcoming treatment, and plenty of other comfy touches are waiting for you too in each treatment room, including pillows and blankets for optimal relaxation. Dentistry is a constantly evolving field, and our doctors take pride at staying right at the forefront of new tools, techniques, and technologies. Our office features a state-of-the-art CT scanner, soft tissue lasers, and many other modern touches that help elevate the quality of your experience at every stage, from the initial consultation to the procedure itself to the finished results. Exceeding our patients’ expectations is always important to us! Juggling you and your family’s busy schedules can be a headache, especially when you need to add dental checkups or a necessary procedure to the mix. Thankfully, we offer extended appointment availability until 8:00pm on most weekday nights to accommodate patients, as well as Saturday hours that save you and your loved ones from having to skip work or school. Our team is proud to make quality dental care flexible for our valued patients. The people we treat here in Roselle Park are more than just our patients – they’re our neighbors too! That’s why our team regularly donates time and money to worthwhile causes and organizations, including St. Jude’s Children’s Research Hospital and the American Cancer Society’s Making Strides Against Breast Cancer events. We love helping make the world a better place and creating even more reasons for people of all ages to smile through our efforts. Roselle Park Dental is proudly serving towns in Union County NJ including: Berkeley Heights, Clark, Cranford, Elizabeth, Fanwood, Garwood, Hillside, Kenilworth, Linden, Mountainside, New Providence, Plainfield, Rahway, Roselle, Roselle Park, Scotch Plains, Springfield, Summit, Union Township, Westfield, and Winfield – as well as all surrounding areas.